Chevy Chase Canyon is the largest canyon in the San Rafael Hills. It was originally named Canon de Sicomoro and was part of the original Verdugo Land Grant from the King of Spain. As referenced in the Flora Wright Collection at the Glendale Library, in 1797, a land grant map shows an Indian village due east of Chevy Chase Drive. In the eighteen hundreds, gold and silver was mined in the Canyon. In the early nineteen hundreds, the canyon was a private game preserve for the Doheny family and the last bear shot was in 1906. The Canyon received the name Chevy Chase Estates from the first property developer in 1926. 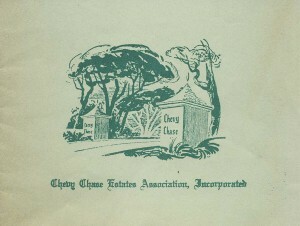 Chevy Chase Canyon’s rich and fascinating history includes the formation (1937) and incorporation (1948) of the oldest active homeowners association in the state of California, the Chevy Chase Estates Association (CCEA). Through the years, the Association has managed to save the Country Club from development numerous times and has initiated many city ordinances that help to keep our hillsides protected from careless development. The Association was responsible for the City Planning Commission and City Council adopting the ‘R1R’ (restricted single-family residence) zoning ordinance in 1956. 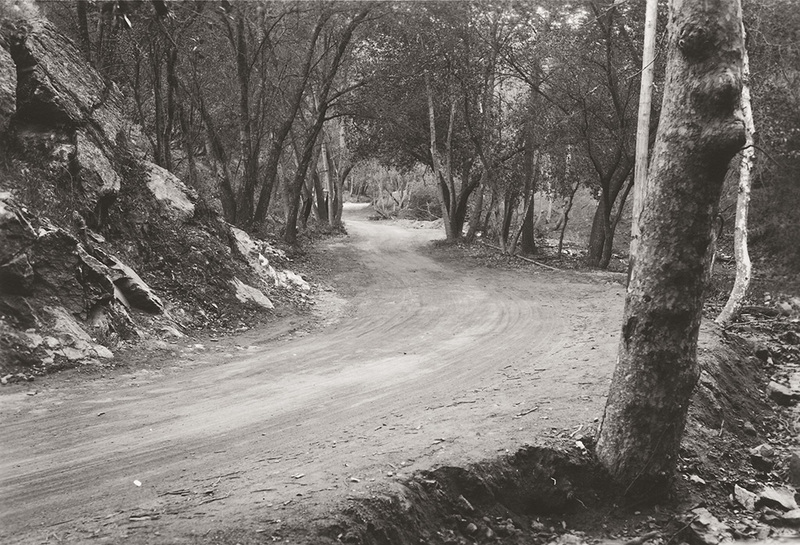 The 215 acres of the ‘San Rafael Ridgeline Property,’ still remain pristine open land today due to the efforts of the CCEA contesting the developers in 1981. 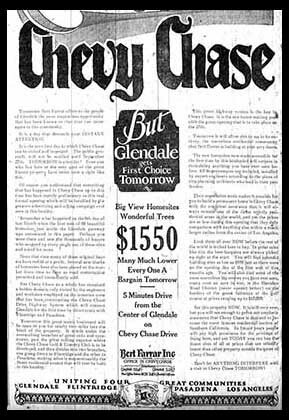 In the 1990’s, the Association was instrumental in the adoption of the Hillside Ordinance in order to maintain the beauty of Glendale’s remaining hillsides. Through the years, the Association has prevented developers from building high-rise condos, apartments, ridgeline communities and commercial properties in order to protect the wild character of the Canyon and the value of Canyon properties. Due to the efforts of many dedicated homeowners over the past 70 plus years, the Canyon remains a beautiful rural-like setting, rich in nature and history. 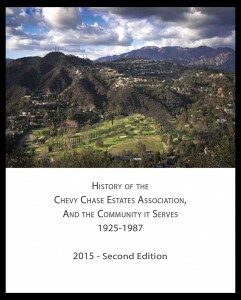 History of the Chevy Chase Estates and the Community it Serves 1925 -1987. New Second edition! Read about the floods, fires, and secret bridle trails, how from the very beginning the state’s oldest homeowner’s association has fought back schemes to make the canyon into a garbage dump, turn the country club into a low-income housing project, or route a freeway straight through the valley. This is a fantastic book lovingly written by a Chevy Chase local. A must read. Photos of the Chevy Chase Canyon from 1882 to the present day. Click to see the slideshow! 25 years, a quarter century, of Chevy Chase Estates Association’s Canyon Crier Newsletters are available to be enjoyed online. Read about the battles the CCEA has fought over the years, many won, a few lost. The Chevy Chase Canyon has seen many changes over twenty five years, but looking over this newsletter archive one will be struck by how some things in our canyon seem to never change. This little quaint gem of Canyon History was recently discovered in the home of two original Chevy Chase residents who had passed on. The small, hand-drawn pamphlet sets out suggestions on how to keep a more beautiful neighborhood. 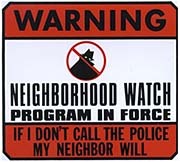 It was published by the Chevy Chase Estates Association and most likely distributed to everyone living in the canyon. No date appears in pages, so the question is, when do you think this was published? Click to read! Thanks to George Ellison from the Special Collections Room of the Glendale CA Public Library for his assistance in the making of the Chevy Chase History Archive.